This is the second post in my new series, “Notes from the Road,” where I share my raw travel notes and thoughts soon after leaving a country. When most backpackers and travelers plan to visit Honduras, they're referring to the Copan ruins and/or Bay Islands. These are the two places I visited, and while there's still the danger of street crime, it's fairly safe for foreigners. Mainland Honduras, outside of Copan, is another story. Unfortunately, Honduras currently has the world's highest homicide rate, and not by a small margin. San Pedro Sula, through which some travelers pass on their way to the Bay Islands is the world's most violent city (outside of actual war zones like Syria). The capital of Tegucigalpa ranks fourth, and also has one of the world's most dangerous airports. It too is a transit point, and should be either treated with extreme care, or avoided altogether. Last year I met Sarah on an island in San Blas, Panama. She taught English for three years on mainland Honduras, and tells me there are many beautiful places in the country, but the dangers are real. I've asked her to write a guest post for those seeking to travel more deeply in Honduras. As for me, I stuck to the well-worn backpacker trail due to both time constraints, and an abundance of caution. Here are my Honduras travel tips. 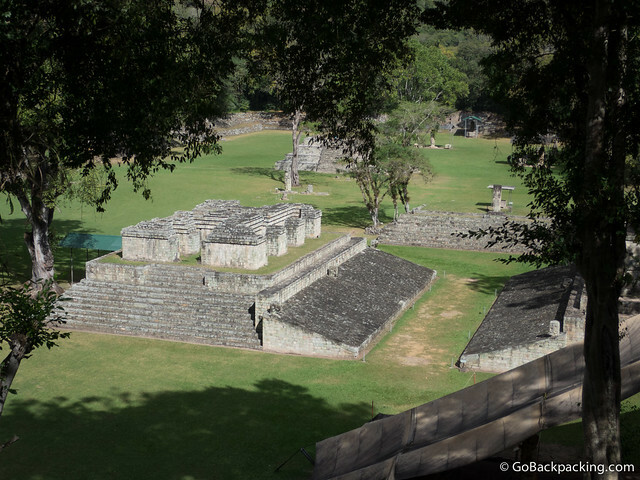 Copan is a Mayan ruin site, and one of Honduras' two UNESCO World Heritage Sites. It's a major draw in Central America, pulling in tourists based in Antigua, Guatemala on overnight trips. In retrospect, this might have been an easier and more comfortable way to visit. There's nothing much around it, so if you don't want to backtrack, you'll either need to travel north overland toward the Bay Islands, or south overland toward El Salvador. It took me 11 hours to reach Copan from Livingston, Guatemala traveling overland by public transport, including a stop at Quirigua, a minor Mayan ruin and UNESCO site. See my Guatemala Travel Tips post for more info on the route. I was exhausted upon arrival, and had to deal with a new case of TD before the sun rose the following morning. 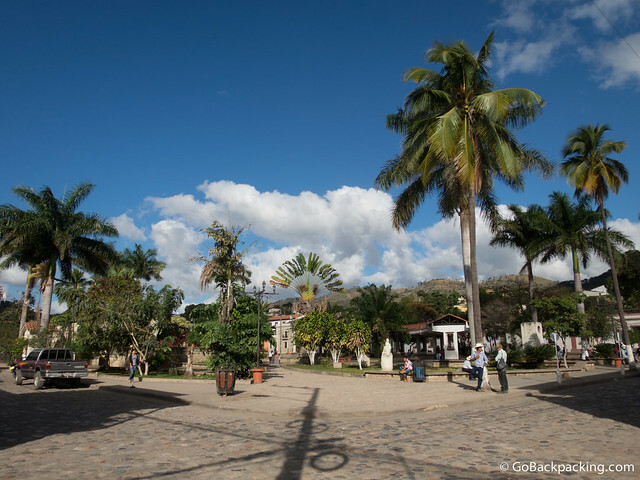 There are a lot of budget options in Copan, though you won't find much on Hostelworld. Check Tripadvisor too. Hostal Berakah – I had a private room with bath for three nights. It was OK for a short visit, but the common area with the best WiFi signal was very small and outdoors, and therefore subject to the elements. It happened to be colder than normal during my stay, so I didn't spend much time there. La Casa de Cafe – Recommended by my friend Leif. Currently ranked #1 B&B on Tripadvisor. The downside is it's about five blocks from the town center. British Colonial House – Great location overlooking the main plaza. I ate my first dinner here, an Indian curry. Owned by a South African/British man who previously ran a place on Roatan. Cafe Welchez – Fully indoor cafe makes it a great place to sit down with a laptop and get some work done. Had a delicious slice of Oreo cake. Good WiFi. Casa Ixchel – Super friendly cafe with indoor and outdoor seating. The owner is the daughter of a local coffee farmer, and speaks fluent English. I ate here twice. The fruit salad is an excellent value. WiFi. The main attraction is one kilometer from the center of town. Admission is $15. Access to the tunnels is an additional $15, and NOT worth it. The tunnels were created by archaeologists to study the earlier temples, and you don't see anything more interesting than what's on the outside. The official rate for a tour guide is $25. My bilingual guide had worked at Copan for over 30 years, since he was a child, and was very knowledgable. Typical tours last two hours. If you do get the ticket for the tunnels, the guide may try to charge you extra. Do NOT pay extra, as you're only in the tunnels a few minutes. Suggest he can wait outside at which point he'll probably say he'll join you at no extra cost. Maybe it was because I was tired, but Copan didn't WOW me as much as Tikal in Guatemala, or Palenque and other ruins in Mexico. I also found it harder to photograph. Another recommendation from my friend Leif was a visit to the Copan Hot Springs, located in the jungle about 45 minutes from town. Organized trips leave every afternoon for about $25, giving people something to do after visiting the ruins in the morning. I skipped it. There are some other minor things to do around town, including a Macaw Bird Park, but nothing that appealed to me. Most visitors to Copan only stay a night or two. I spent a third night only because I was sick. At the time of my visit, Hostal Berakah was running a private shuttle to San Salvador every Wednesday, but unfortunately for me, it departed 12pm on my first full day in Copan. Even though I'd already seen the ruins by 11am, I wasn't feeling well enough to make the journey. The cost was $30, and it was estimated to take six to seven hours. Instead, I gave myself two more nights, and started taking some leftover Cipro I had from a similar problem the previous year in Mexico. Luckily, it worked quickly because it was another seriously exhausting day on collectivos and chicken buses to reach San Salvador. 1. Collectivo at 6:30am from Copan to Santa Rosa (I paid double to get the two front seats to myself). The trip was close to three hours over rather poor roads. 2. Coach bus from Santa Rosa to border with El Salvador. Another two and a half hours at a cost of $5. 3. Took the wrong chicken bus and ended up heading toward the Guatemala border. Add an extra two hours onto my day at a cost of $1.25. 4. Took the proper collectivo to the El Salvador border. It took fifteen minutes at a cost of $0.60. 5. Border crossing was easy. Only option is a chicken bus from border to San Salvador. Waited 45 minutes for enough people, and then it was a slow-as-hell three and a half hours to reach the bus terminal in the capital. The cost was only $1.70. 6. Taxi from bus station to Joan's Hostel took about 20-30 minutes at a cost of $10 (negotiated). I'm guessing the Bay Islands receive the lion's share of tourist dollars in Honduras. Whereas visitors to Copan stay a night or two, visitors to Utila and Roatan often stay much longer, even weeks or months at a time. I met several expats who'd been living there for years. The main draw is easy access to the second largest barrier reef in the world, and the diving and snorkeling opportunities that come along with it. 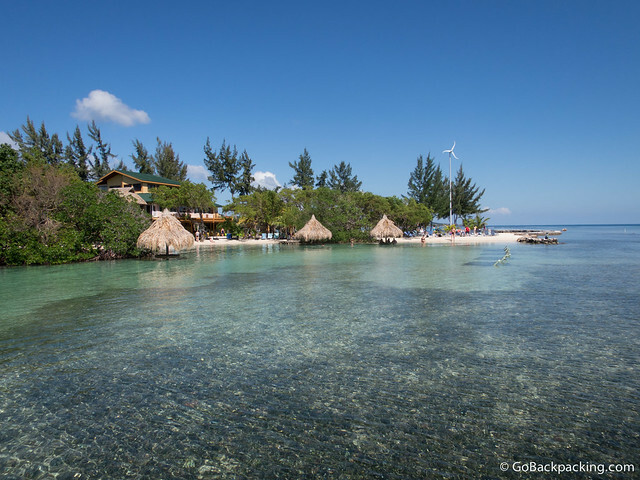 Utila is known as one of the cheapest places in the world to get your PADI certification. It has cheaper accommodation and restaurants, and a very active nightlife scene due to all the backpackers. Roatan, by comparison, is quite a bit more expensive. It has increasingly catered to the cruise ship industry the last five years, and the popular beaches (West Bay, French Cay) are flooded with cruise passengers whenever a ship (or ships) is in port for the day. 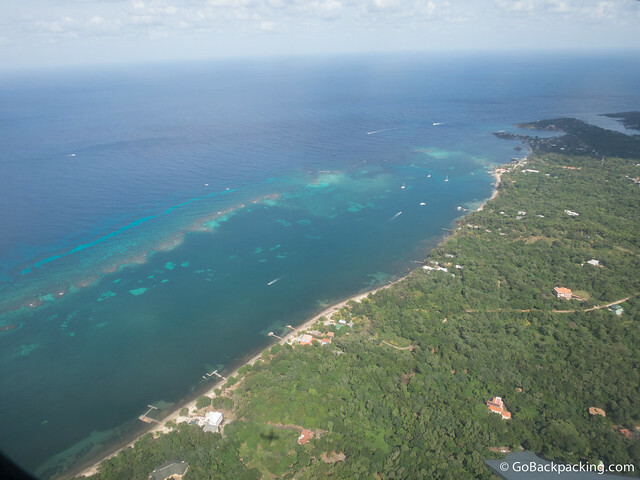 If trying to choose between Utila or Roatan, check out Alex's post as she does a good job comparing them. I spent my full week on Roatan for a variety of reasons, and unfortunately, there was only one full day of sunshine the whole time. A late-running rainy season was to blame. I chose to fly from San Salvador direct to Roatan on Avianca (formerly Taca). The cost was $397, as it had gone up $87 the night before I booked it. Still, it saved me an arduous one to two days of traveling overland via buses, and a potentially nauseating ferry ride. Plus, I got to see the western part of the island from the air on arrival. Once on the island, I was planning to fly Avianca to the Honduran capital of Tegucigalpa for $120, and then take a bus to Leon, Nicaragua. I changed my mind for two reasons. First, the airport is super dangerous, and second, the flight arrived in the afternoon, and I would've had to spend the night in the city before catching a bus the next morning. Instead, I flew Avianca to Managua, Nicaragua via San Salvador. The cost was $380. A private taxi from the Managua airport to the UCA bus station was $15 (negotiated), and then it was another $2 by collectivo to reach Leon. The official rate for a taxi from the airport to West End, the most popular place for foreigners to stay on Roatan, is $20. It's posted at the airport, making it easy for taxi drivers to point directly at it when you try to negotiate a lower rate. Consider it a success if you can get anything below $20. Try asking for $10, and you can probably settle at $15. Alternatively, walk across the small parking lot to the road, and you'll probably have better luck by hailing a passing taxi. I couldn't do better than $15 for any of my three taxi rides on Roatan (airport to West End, Coxen Hole to French Cay, West End to airport). But, when you hear the locals need to only pay 45 limpiras ($2.25) to go from West End to the airport, you realize how much negotiating room you've got to work with. Here's the thing, the taxi drivers can tell a tourist from an expat or someone living on the island, and they won't get nearly as much to the tourist who comes and goes within a few days. Whatever you end up paying, don't be surprised if the driver slows down to try to pick up more passengers en route to your destination. Among locals, taxis are shared with multiple passengers to make the cost so affordable. Drivers knowingly try to apply this same tactic to the higher priced tourist fares, but simply tell them “no” and they should respect your wishes. I had to do this on two of my three taxi rides, and did so out of concern for my safety and not realizing it's normal for locals to share taxis. On the bright side, a local collectivo from West End to Coxen Hole (or vice versa) is only $1.25 whether you're a local or tourist. If you want to travel between Roatan and Utila, a direct and private boat ride costs $50 per person, and requires a minimum number of people. For about the same cost, you can take the Roatan ferry back to the mainland, and transfer to the Utila ferry. This option takes around four hours. These rates are for the high season. Buena Onda Hostel – This is one of the few hostels located in West End, thus making it popular with backpackers. A big downside is that it's located near the gas station, which is a good five to ten minute walk from the main road in West End. It doesn't sound like much, but it can be dangerous to walk it at night, especially alone. Robberies are known to occur, as the street is not fully lit. Casa del Sol – A block from the main strip, this hotel is popular with expats working on the island. I spent two nights in a garden level room for $40/night, and it includes a very basic kitchen. The second floor Deluxe rooms are nicer, with porches, hammocks, and better WiFi signals. These are harder to get as the expats rent them by the month. It's located a block from the main road in West End. Georphi's – Located on the main drag, they offer everything from dorms to private rooms. I looked at a huge second floor private for $60/night but it was more space than I needed. WiFi depends on which room you're in. Located next to a big club, the music can be loud until 2am on the weekends. Posada Arco Iris – One of my favorite places that I saw but didn't stay at. One of the few places I looked at where you can see a sliver of the beach and waves from your own porch at $40/night. Good WiFi, but signal varies depending on the room. Splash Inn – I spent my first four nights here at $60/night and it was a good value. I had decent WiFi in my room, air-con (though I rarely used it), and cable TV. There was also daily maid service, and the Italian restaurant has one of the better views of the water. Much of the food (aside from locally grown fruit) is imported from the mainland, which drives up cost. That and this is clearly a tourist area. Street food is an option at night, and can cost you less than $5. There are also some local joints selling chicken and such that are cheap by island standards. In other words, look where the locals are eating, and go there too. A typical cafe or restaurant meal will run $10 to $15 for a main dish and drink, plus tax and tip. Seafood and steaks can drive the prices up to $20 to $25 per person. 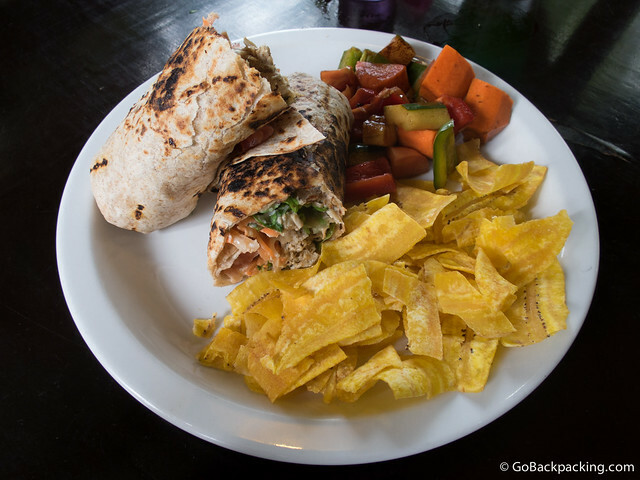 Cafe Escondido – Owned by a former expat dive instructor, it's one of my favorite spots. Good sea views, food and WiFi. Earth Mama's Garden Cafe – Canadian owned. Offers healthy organic dishes. Friendly staff. WiFi. Mostly outdoor seating, so not a good option if it's rainy. Sundowners – Canadian owned. Popular place for happy hours, and sunsets of course. The huge burgers are an excellent value (about $7 or $8). The Buena Vida – Expat owned. Don't judge the food by the small informal setting. The food quality is good, though I fond the portion sizes a little on the small side. Tong's Thai Island Cuisine – Pretty good Thai food with a sea view. To see all my reviews, check out my profile on Tripadvisor. Beach at West Bay – Resorts have been built up along this beautiful sandy beach. This is the place to work on your tan, and it's only a $3 boat taxi ride from West End. On cruise ship days, the beach is packed. Diving – West End is saturated with dive shops. Fishing – Plenty of opportunities to catch big fish. The boats can be small, and the seas can be rough. French Cay – It's expensive, but a great way to spend a day, whether visiting the island on your own or on a cruise. Visiting French Cay from West End cost me around $90, including transport (collectivo, taxis, boat ride). Rent a Scooter or Truck – Explore the eastern part of the island via your own transport. A friend said it can cost $70 to rent a vehicle, which is a good deal if you can split it amongst several people considering the cost of taxis. Snorkeling – You can rent a mask and fins just about anywhere, and go for a snorkel in Half Moon Bay (West End), or near the rocks at the far end of West Bay. I did neither. Full day trips to other islands closer to the mainland are between $150 to $180, including lunch with champagne and lobster. If the weather's nice, they're suppose to be beautiful, but this was too steep for me even if the sun were out. Based on my findings, there's little in the way of two or four-hour trips. It's either DIY, or a full day trip. Anything in between is hard to do cheaply as a solo traveler. Stanley Submarine rides – Starting at $500 per person for a 1,000 foot dive, this is what may be the only place in the world where a tourist can go on a submarine ride to these depths. A 2,000 foot dive will cost you $900. Copan was underwhelming, and Roatan was overpriced. I have to admit the high costs and rainy weather dimmed my view of the island. I didn't feel like I got to know Honduras as a country, nor its culture, people or food by visiting either Copan or Roatan. But, I'm glad I went to both and would consider going back to see more of the mainland if and when the security situation improves. wow such detailed tips, really appreciate it. I didn’t realise how dangerous these places were either. 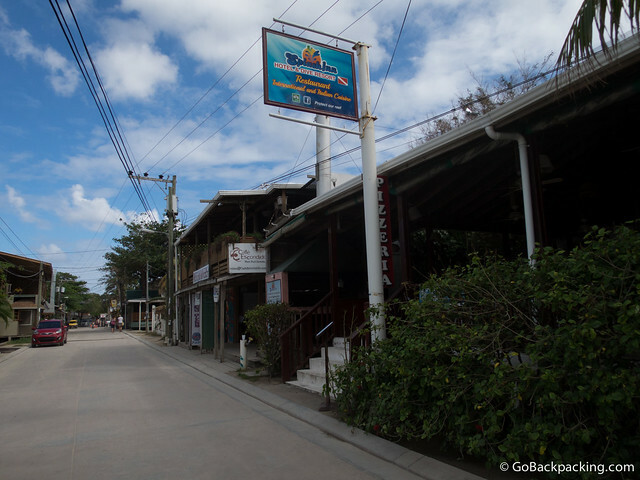 I visited Roatan for a day, actually as part of a cruise. I hate cruises but a huge group of my friends were going and I didn’t want to miss out! We really wanted to do something interesting since our last three stops we’d spent at the beach and snorkeling so hadn’t really experienced any local culture (nearly impossible on a cruise). We booked a hiking excursion and it was my favorite thing I did on this trip. We had a local guide pick us up at the cruise port and my 2 friends and I were the only ones on the tour – guess no one else on our ship wanted to hike haha. He drove us through the town and pointed out a bunch of different things and told us about local culture such as school, uniforms, what people do for work, etc. The actual hike wasn’t anything spectacular but a good way to burn off the cruise ship calories and our guide knew SO much about all the plants and the few animals that we saw. Afterwards he took us to buy corn on the side of the road but I was afraid to eat it because the same woman who was cooking the corn was braiding people’s hair right next to it (LOL). I’d like to go back someday and stay overnight! That’s cool that you can do a submarine dive even if it is that pricey. Guessing it is geared towards the cruising crowd, anyway. Otherwise, I probably would want to spend more time on Utila from the sounds of it. Copan Ruins is the best. . I didn’t check out the tunnels when I was there. I kind of wish I had. We totally tried to bribe the guy who was guarding the gate to let us both in for $10. No joy. Since when can’t you bribe someone in CA? Maybe next time. Copan was by far the favorite of all the ruins we visited in CA.